Absolutely the best of best that everyone should grow. Gets big and really puts on a show. Small to medium size deep rich Purple flowers with creamy Yellow Stamens. Awarded the RHS Award of Garden Merit in 1993. Very free flowering. A must for every garden. 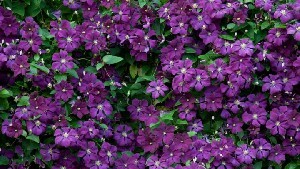 Very easy to grow.I can't say enough about this clematis.